The fifth annual Notes For Notes benefit concert and auction took place Sunday, June 7th, in front of an exuberant sold out audience. Notes For Notes is a Santa Barbara based organization started by Phil Gilley & Roderick Hare and presented by local musician Seymour Duncan, who is better known nationally as one of the premiere designers of electric guitar pick ups.His relationship with some of the top rock guitar players in the world has led to the annual benefit concert. Notes for Notes started in Santa Barbara in 2006; now becoming a nationwide organization five years later. Notes to Notes partnered with the CMA foundation in 2014, and CMA has agreed to support the development of five new Notes for Notes Studios in San Francisco, Detroit, Brooklyn, Austin, and Atlanta by the end of 2015. CMA also introduced Notes to Notes to Chevrolet, who announced their support of the Detroit studios at the December 2014 CMA Awards. With celebrity support nationwide, Notes for Notes is now able to offer our young musicians the opportunity to explore, create, and record music free of charge. 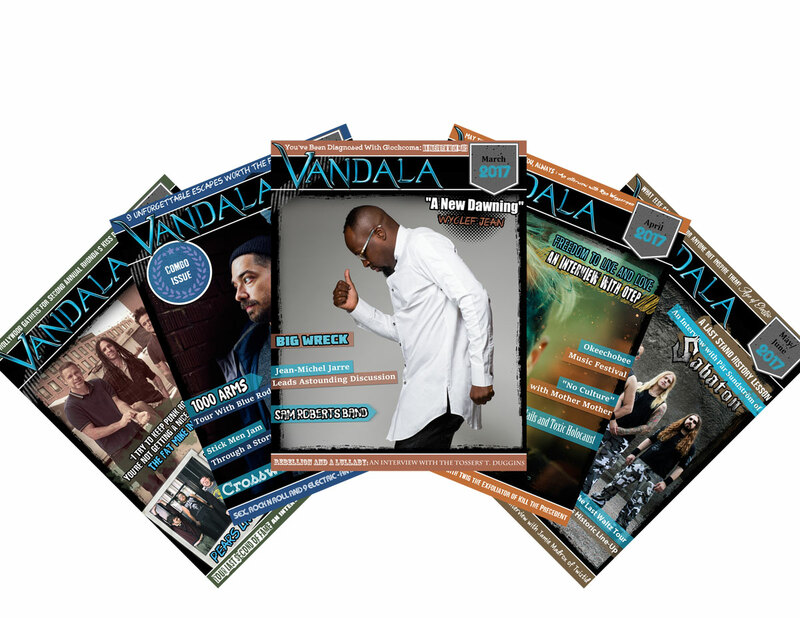 NFN’s core belief, that music is the universal language of mankind with the power to transcend virtually any cultural, racial, or socioeconomic barrier, has taken root across the nation. The concert Sunday night began with a set of cover tunes and original music from some of the local Notes For Notes musicians. These included Jackson Eddy on bass, Jamey Geston and Brandi Rose Lentini on vocals, Chimaway Lopez on guitar, Casmali Lopez on drums, and a very young dreadlocked Seku Fujino Harmachis on guitar. Lentini lead the band in channeling the spirit of Janis Joplin in some bluesy rock tunes, before Geston took over with a more folk inspired feel to her vocals. Singer and songwriter Maxton Sculte then joined the band to lead them in some original tunes that he wrote and the band was joined by 15 year old guitar wizard Stephen Dashiff. After an intermission where patrons could bid on an array of rock swag including signed electric guitars, Peter Frampton took the stage with his five piece band of veteran musicians. Frampton wasted no time launching into his classic rock hit laden set list. 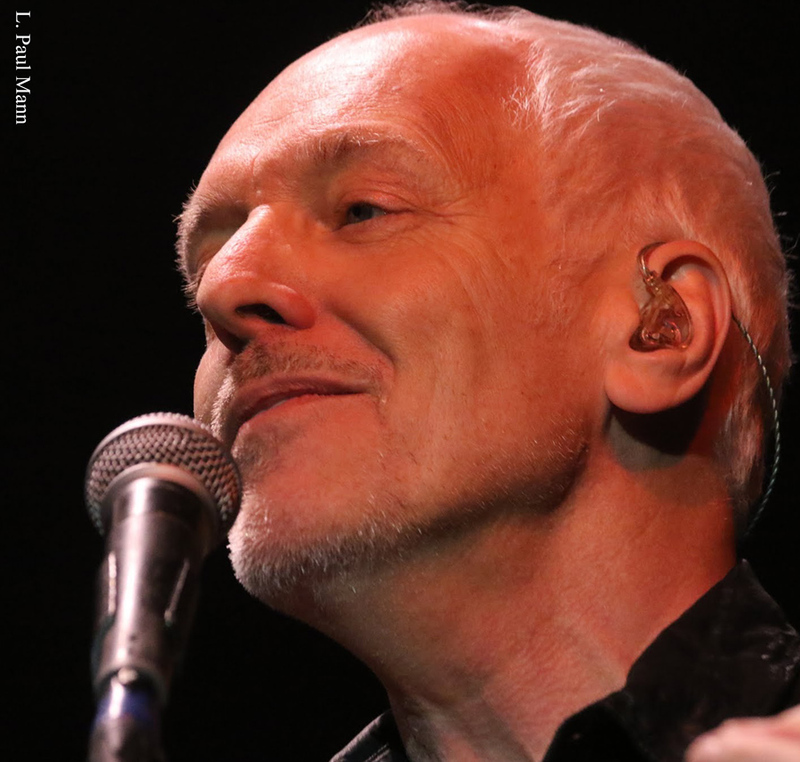 The musician drew heavily from his fifth solo album, Frampton Comes Alive! which remains one of the top-selling live records of all time. But he also delved into material from the successful English rock groups that he been part of as far back as when he was just 16 years old. He also did some classic covers included Soundgardens “Black Hole Sun”. The 66 year guitar legend expressed his great pleasure in being able to play the Notes For Notes benefit. In a break between songs Frampton said that he had been friends with Duncan for a long time and that he had been promising his old friend that he would play the benefit concert since the beginning, just finally being able to fit it into his schedule. Frampton then expressed his deep belief in the mission of the organization reminding the audience that he had been given an enormous opportunity to play with the English band The Herd when he was just 16. 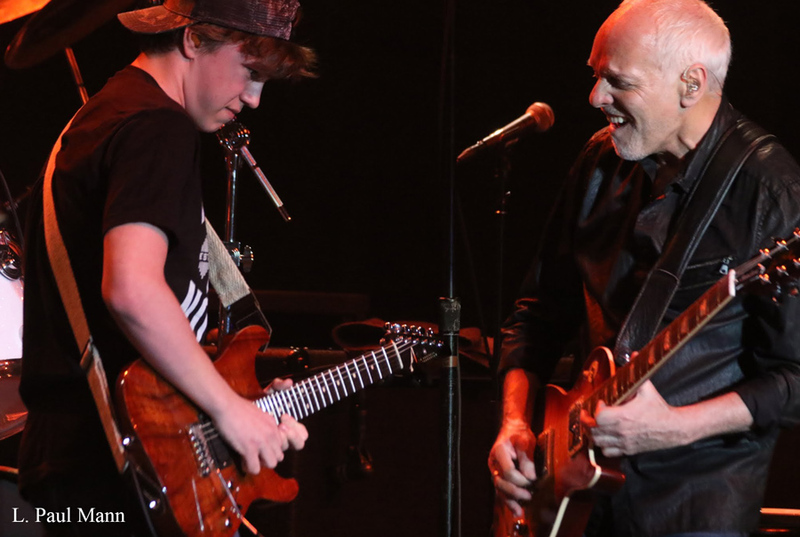 He then introduced local guitarist Dashiff back to the stage and played an extended jam session, highlighted by an emotional guitar battle between Frampton and the young 15 year old guitar phenom. You could tell that Frampton was ecstatic to play with the young musician and beamed a giant smile throughout the jam. The evening ended with an encore that brought the set in the tiny theater to a near two hour conclusion. During the five year annual shows musicians have included no less than The Steve Miller Band, Slash with Seymour Duncan, Robert Randolph, and Don Felder, Los Lobos, and Joe Bonamassa and Jimmy Vivino. Frampton’s name can be added to the legendary event. ← Sam Roberts Band Share Psychedelic Video for ‘Counting the Days’!